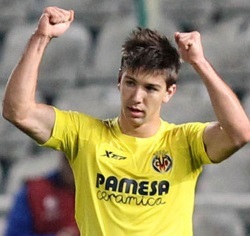 Valencia CF: Luciano Vietto to join Valencia CF? Luciano Vietto to join Valencia CF? Luciano Vietto is another possibility for Valencia CF as the club is looking to reinforce and strengthen the squad before the start of the next season and the club is looking at talented players that may be surplus to requirements elsewhere and would come cheap. One such player is Luciano Vietto who hasn't found his footing at Atletico Madrid and as such he is seen as surplus to requirements there and therein lies the chance for Valencia CF to swoop in and acquire the player. Valencia's new coach Marcelino Garcia Toral is a fan of his as the player did great when playing for Villarreal under the tutelage of Marcelino. He is also going to come at a cheaper price and his salary is also manageable for Valencia CF, once the club offloads the big earners like Negredo, Enzo, Aymen and others. Two more bigger earners are Garay and Zaza, but those are key players for us, and were bought very recently, so they are staying at the club and with Mangala gone as well, that is additional 3 million euros that can go towards a new salary.